Find out how to read numbers in Japanese using this! Can you say this number in Japanese? This is the population of Japan according to the census in 2005. It's read like this: "Ichi-oku ni-sen nana-hyaku nana-juu roku-man has-sen". If you're not used to dealing with big numbers in Japanese, it's quite hard to read, isn't it? Here, we'll introduce a really useful online tool for when you need to read figures in Japanese or you want to convert numbers written in kanji into romaji. ※This tool forms one part of sci.lang.japan Frequently Asked Questions (Introduction article). 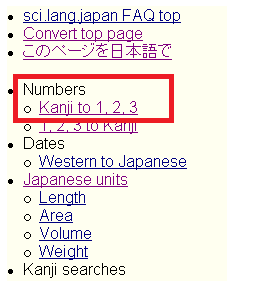 This is a number converter made by the creator of Kanji searches at sljfaq.org (Introduction article). If you input a number in written in arabic numerals, or in English, this tool will convert it into kanji. The function also works the other way round. Enter arabic numerals, or the way a number is said in English, into the box marked 'Number or English', then click on 'Convert to Kanji number'. The corresponding kanji number, kana and romaji are all displayed, as shown in the screenshot below. If you want to convert a number written in kanji into arabic numerals, click on the link on the page which you see outlined in red on the screenshot below. Input your number written in kanji into the 'Kanji number' box, then click on 'Convert to arabic numerals/English'. Arabic numerals and the way the number is said in English will be displayed for you, as shown in the screenshot below. but they are quite difficult to get to grips with. You can use this useful converter to help you practise! Re:Find out how to read numbers in Japanese using this!